Under constant surveillance by hurricane hunters and the NASA Global Hawk drone, Erika has shown her more ragged side this afternoon. Diurnal (or daily) swings in thunderstorm activity, winds, and organization are not uncommon in weak tropical systems especially under sheared conditions. During the overnight hours last night, there was an upswing, and now we are currently in a downswing. In the long term, assuming no dissipation, these swings many not have much of an overall impact on later intensity or track. We’ll talk about that in a bit, but first it is time to talk early impacts. Also want to note that the Caribbean system may not be the only landfalling system next week, but I will leave my thoughts on the futures of Tropical Storm Ignacio and possible impacts to Hawaii to a later post. Erika is likely to continue these pulses of thunderstorm activity and organization through probably late Thursday or Friday when conditions may become a little better. What does that mean for the islands? Probably intermittent waves of showers and thunderstorms during the overnight hours. 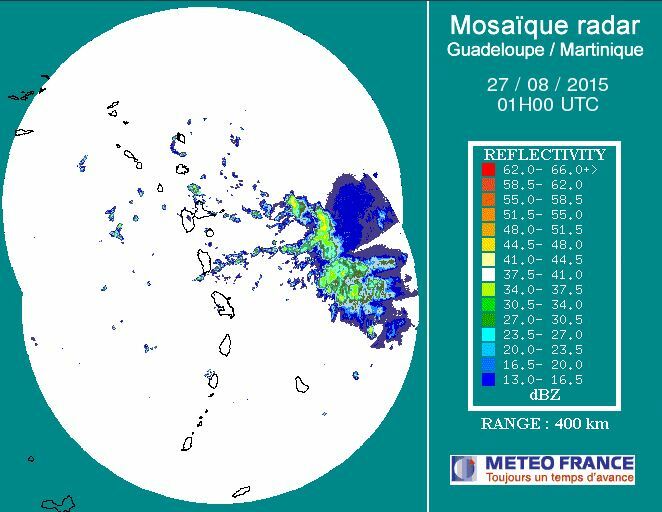 You can already see some of that heavier and intensifying rainfall east of Martinique and Dominica on the Guadeloupe radar. This will arrive tonight along with probable gusts to 45 mph at times, again in waves. Rainfall: Most of this rainfall will be beneficial. Rainfall amounts of 2-5″ is possible from Martinique to the British Virgin Islands overnight and into tomorrow morning. A few higher and upslope/eastward pointing locations could see amounts to 7″. For Puerto Rico and the USVI, impacts will be mainly tomorrow afternoon with similar rainfall totals regardless of how strong the winds are. The highest points in Puerto Rico could see up to 8″, but this will be in highly isolated spots. For locations where the ground is still hard from the lack of recent rainfall, runoff flooding could be a problem especially in lower elevations. NWS San Juan currently has a moderate threat of flooding for the western half of the island where rainfall has been more plentiful in recent weeks. Winds: Winds of 30-45 mph are likely from Antigua to St. Maarten overnight, and then for Puerto Rico and the USVI tomorrow. Winds will be gusty in nature, and will come with rainfall bands. Please heed tropical storm watches and warnings in your area. In many cases, tropical systems have characteristics that follow them throughout their lifetime. For Danny it was the diurnal/daily upswings in thunderstorm activity during the overnight hours no matter how strong the system was. 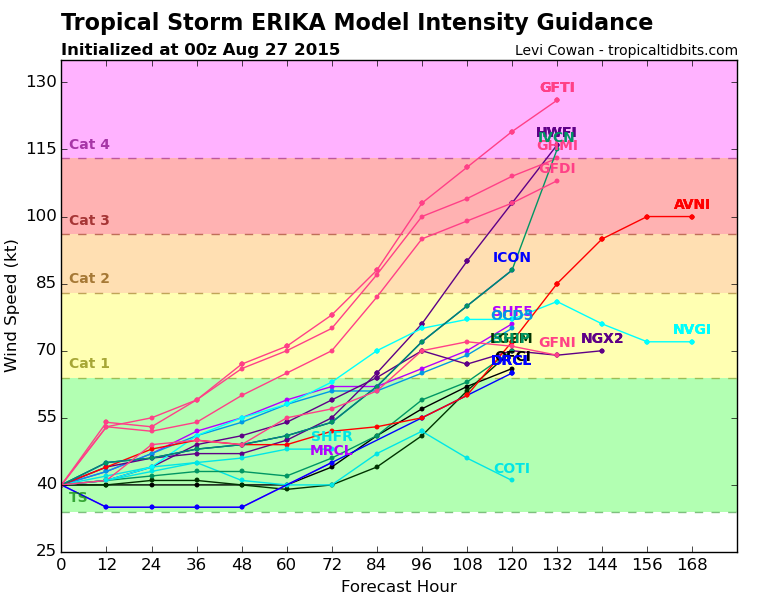 For Erika, it appears that it will be a lopsided system at least for some time. Visible imagery throughout today indicated that the low-level center has routinely been on the northern edge of the strongest convection, and occasionally entirely to the north of any cloud cover. This is due to strong mid to upper level winds that blow those layers southward. Mid layer shear analysis continues to show a pattern of mid/upper level highs and lows that net to winds from north toward the south. Until this shear and even higher winds aloft abates, Erika will have no hope to organize and thus intensify. This is a good thing for the islands ahead. It should be noted that Erika may not be feeling the upper levels of the atmosphere, and thus some of the shear that is shown on those maps may not be impacting this system yet. Dry air at this point is not too much of a factor in the intensity forecast, although there is a batch of drier air a few hundred miles ahead of Erika. Visible imagery before sunrise showed an actively simmering system with many overshooting tops. These “Vortical Hot Towers” are very cold topped thunderstorms that release intense amounts of heat into a tropical cyclones core and help to move the system into the enhancement phase. The southwest side remains weak according to recon. The Hurricane Hunters have been having a difficult time finding tropical storm force winds late today, and it is entirely possible that Erika has weakened a bit. The possibility of future weakening is nonzero. 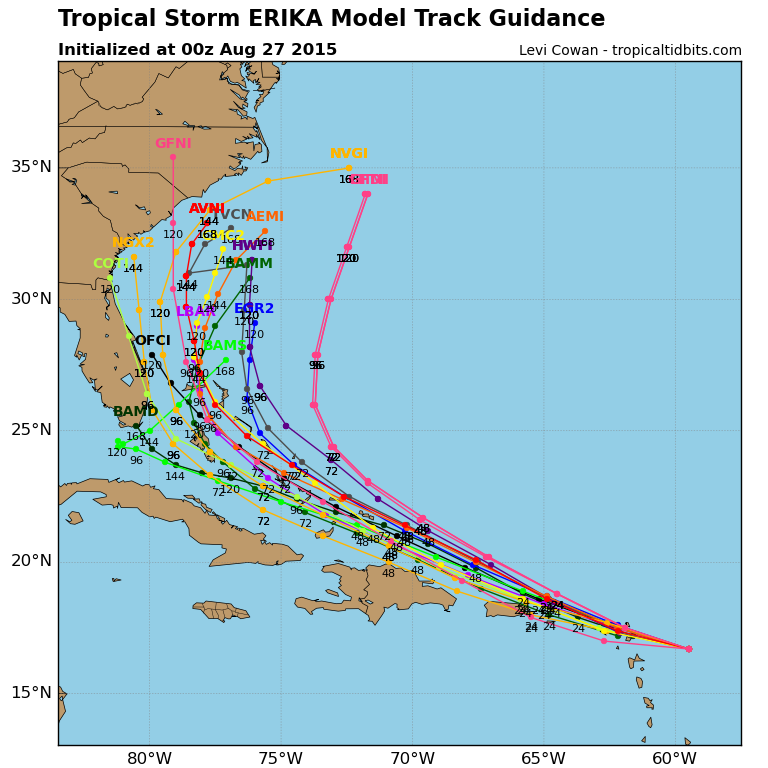 Erika is especially prone to the daily swing of temperatures called the diurnal cycle. On land, this typically results in the most rainfall and storm activity during the day when land temperatures are the hottest. These land temperatures swing often 10-30 degrees during the day and create heat that must go up. This up allows storms to grow. The cooler the temps aloft are, the faster the hotter air goes up. This is true over the oceans as well, but in a different way. You may know that the ocean temperatures do not change nearly as much during the course of a day. Early/weak tropical systems feed on this warmth throughout the day and night. What changes is the air temperature aloft. The coldest temperatures from top to bottom over the ocean occurs in the mid to upper levels of a tropical cyclone, away from the center. At night, the air cools off. This creases the same effect as over the land, just at night! This is why tropical systems often pulse up overnight and pulse down during the day. As of 8p ET, I was already seeing signs of that. In the early part of the forecast, it is pretty easy to say that it could be two “days” before we know the end result with any certainty. Tomorrow will likely result in another downward swing. Each upward swing aggregates a little more energy and organization assuming no bursts of dry air and shear. The checkpoint is likely somewhere north of Puerto Rico or the Dominican Republic. Modest weakening and intensification is possible during this time. As of the 8pm advisory, winds are officially 45 mph. It is already apparent winds may be on the upswing. Point #2: Don’t worry over models beyond 3 or 4 days. Get prepared just in case! Remember, those storm kits can be used when daily/regular storms hit too! Recon has reported strong banding in the southeastern side of Erika, with lightning. Lightning is usually a sign of intensification in tropical cyclones, and is likely a confirmation of the overnight upswing beginning. Latest satellite trends confirm that notion. Modest intensification is possible through sunrise local storm time. Track on this system is highly dependent on intensity with this storm as evidenced by the swing in models today to the right. A stronger system is likely to be to the right about out to sea…with an asterisk that I’ll get to in a bit. A weaker system will be farther left and closer to the islands. NHC is somewhere in the middle. I should mention that beyond day three, track is of moderate or low confidence. This is where the asterisk comes into play. There have been several models that have gotten stuck somewhere, or in some cases everywhere, north of the Bahamas or near Florida. Anti-squeeze play is a possibility by early next week. The main reason that Erika will be trekking WNW is that it will be following the periphery of the Bermuda high. That high will be a little weaker in a couple of days. Like a twig in a river opening up into a lake, that sets the twig afloat at a slower pace. Piece number 2 of the future puzzle is the trough that could come down into the Gulf of Mexico. For quite a few days, that trough had left the picture, and it is now back. This would push the system away from Florida toward the beginning of next week. In between those two features, steering flow could become weaker. We’ll reevaluate this in a couple of days. This is a wait and see. The best bet remains to be a track near the NHC. The intensity models tonight have a few different trends. At the top are three pink models that can quickly be thrown into the less possible bin since I just do not see much intensification happening tomorrow. Moving down the graph are a mixture of statistical and dynamical models that seem to be at least somewhat possible with modest intensification. In the third group are the underliner squad that includes the NHC and LGEM and later the GFS. In one similarity between these last two groups is a modest intensification between 18 and 36 hours. This could be diurnally driven, but still notable. Also notable is that the GFS has come over to the dark side in both track and intensity and no longer shows Erika remaining weak over the islands. That is the last global model to switch sides. This change is likely due to better information being fed in my the hurricane hunter squadrons. Two possibilities not seen in these models are landfall/land interaction and mid-afternoon weakening. Due to Erika’s convection being on the southern side of its core and likely closer to the land, any chances of land interaction with the mid level center are increased. Most tracks show some interaction with the Bahamas. Most of those islands in the archipelago are flat, but some core interaction is possible. Bouts of weakening during the day is entirely possible. Again, looks for day to day trends rather than model run to run. Daily changes in intensity are possible over the next 24 hours. After that time, slow strengthening is possible north of the eastern Greater Antilles. Waves of rainfall will move through the lesser antilles over night and closer to the US territories tomorrow. Preparations should be ending from and including Puerto Rico eastward. Floridians and Bahamians should be actively watching advisories from the National Hurricane Center and local weather service offices and getting your storm kits together. Preparation is key. There is a chance that a hurricane could be moving through the Bahamas and near Florida early next week. Los cambios diarios en la intensidad son posibles durante las próximas 24 horas. Después de ese tiempo, el fortalecimiento lento es posible al norte de la región oriental de las Antillas Mayores. Olas de precipitaciones se moverán a través de las Antillas Menores durante la noche y más cercano a los territorios de Estados Unidos mañana. Los preparativos deben terminando desde e incluyendo Puerto Rico hacia el este. Floridanos y bahamenses debe observando activamente avisos del Centro Nacional de Huracanes y oficinas de servicios meteorológicos locales y conseguir sus kits de tormenta juntos. La preparación es la clave. Existe la posibilidad de que un huracán podría estar moviéndose a través de las Bahamas y cerca de Florida a principios de la próxima semana. Be prepared, and stay safe! Prayers continue for the WDBJ and news families. Posted on Wednesday, August 26th, 2015, in Florida Weather, Tropical Weather and tagged Bahamas, Dominican Republic, Erika, Florida, Haiti, High Pressure, Hispaniola, Hurricane, lesser antilles, Puerto Rico, s, thunderstorms, Tropic, Tropical Storm, Trough, USVI. Bookmark the permalink. Leave a comment.